You can tell the weather here has improved – I’m blogging less often and I have a backlog of walks to upload. The reason for the backlog is that I have been out walking so much, often for four days a week which is not bad considering I am not fully retired yet so still work some days. The forecast today wasn’t great so I thought I would catch up a bit and add a post from a walk a few weeks ago. It was a walk that didn’t work out as I had planned but which had an unexpected bonus thanks to a lovely couple, Liz and John, but more of that later :)! This day I decided to take a slightly shorter walk, just 10 miles, and to stop along the way to do some ‘proper’ photography. I planned to do a circular walk taking in a lovely inland ridge, dropping down to the coast to walk along the water’s edge for the return leg. It all started fine with some spectacular views from the ridge on a beautiful sunny day as had been forecasted. After a few miles I dropped down to the coast path to make my way to one of the few places on this stretch of coast where there is access to the shore with the intention of walking along the rocks to get a different view of the coast from the more normal cliff-top path. However, when I got there I discovered that the tide was coming in which posed a problem because the foreshore gets cut off in several places at high tide, making in impassable. Now I had checked the tide tables before going out so clearly either the tables were wrong or I had misread them – probably much more likely the latter! 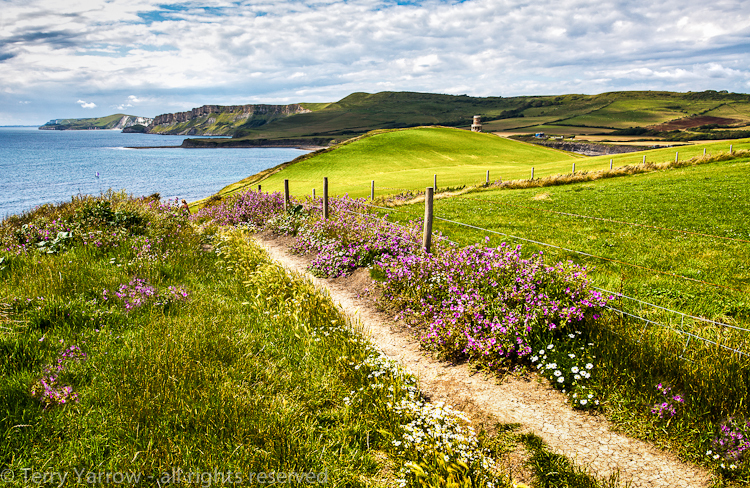 So I had to walk the more usual cliff tops – which turned out to be a great bonus in the end :)! 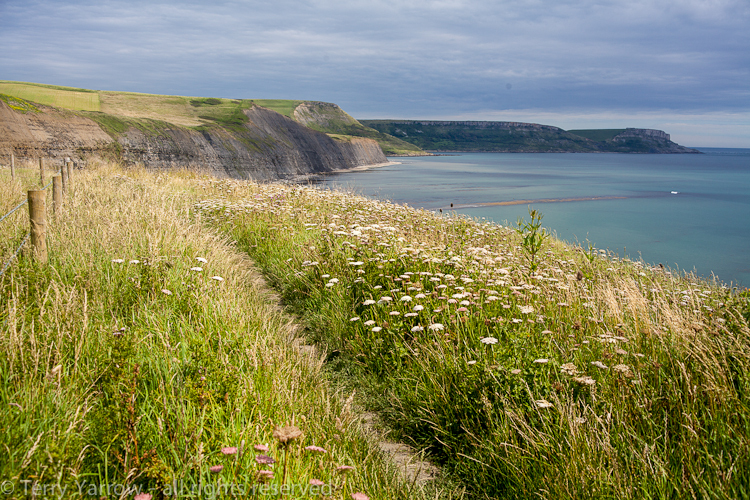 The flowers along the coast path were gorgeous and walking along this undulating path was a real audio visual experience with the amazing views, gorgeous flowers and the undulating song of the skylarks overhead seeming to match the undulating path. Aside from the fact that I had all my camera equipment with me, it was such a relaxing and leisurely walk. 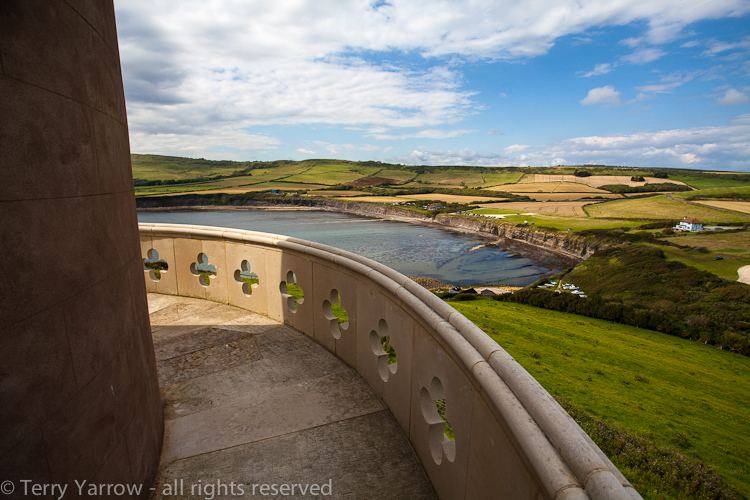 The real surprise came when I reached Clavell’s Tower :)! This is a tower I love and have known all my life from its days as a derelict building in danger of falling into the sea, through its dismantling stone by stone and its rebuilding some 30 meters inland, to its restoration and re-opening as a holiday home by The Landmark Trust. I have hundreds of pictures of it already……..but there’s always room for one more ;)! So I was leaning on the gate taking the picture below when the new tenants for the week, Liz and John, arrived at the gate. We got chatting, as you do, and they very kindly asked if I would like to have a look inside. Well I needed no second bidding and jumped at the chance as I had not seen inside it since the restoration! The tower has four floors with the lower floor being a basement. That was the only floor I had previously stood on because in the days before its restoration that was the only floor that existed – and it was just dirt. The others had crumbled or been destroyed by fire long since! When I was younger, that floor proved useful as an outdoor toilet (well there is no other cover around that could be used for that purpose 😉 ) so I thought it was quite fitting that the basement still provides bathroom facilities – albeit it is nicely tiled now ;)! The entrance steps lead to the ground floor (or is it first floor) and the kitchen and dining area. Then the second floor is the bedroom with the top floor being the lounge. Liz and John kindly allowed me to take some photos even though I was invading their space. 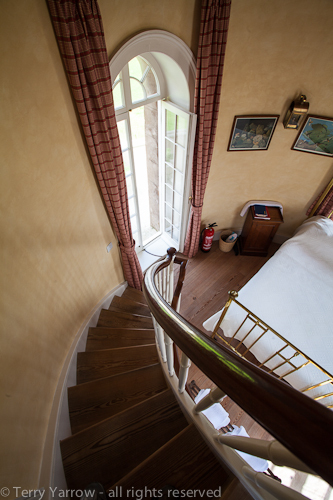 The only way of getting between floors was via the curving staircase which takes up some space. 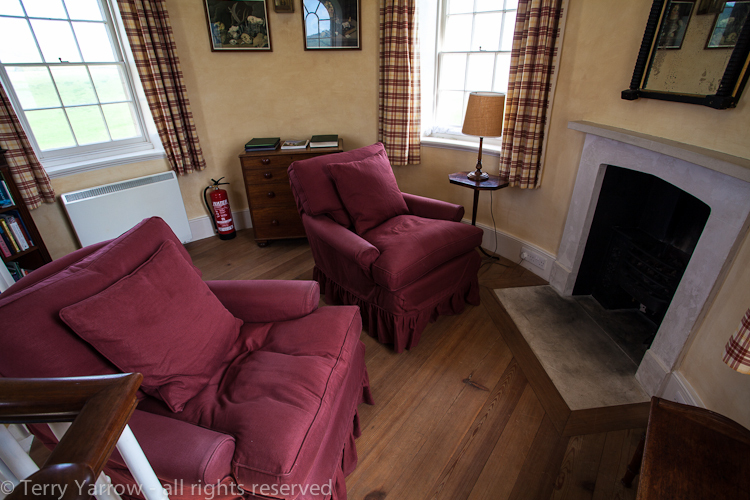 This means that the tower is only big enough for two – I guess Thomas Hardy knew that when he wrote ‘Two on a Tower’ which was based here – but I think The Landmark Trust have done a fantastic job in restoring the building so sensitively. 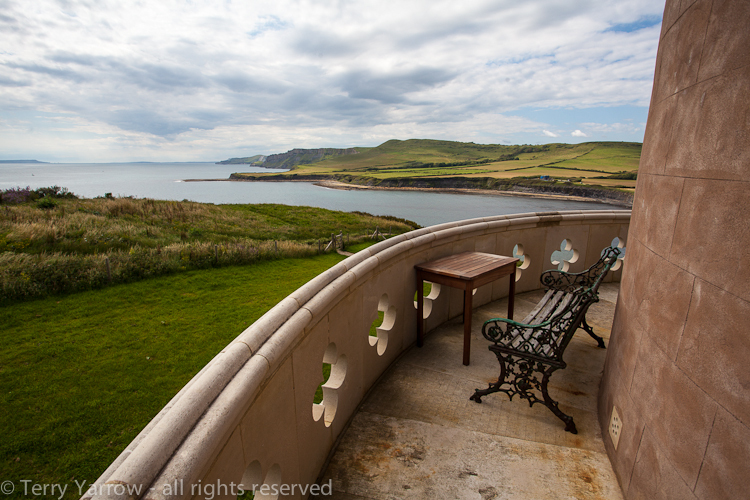 Probably the best part for me was the gallery that is accessed from the bedroom, this has amazing views! 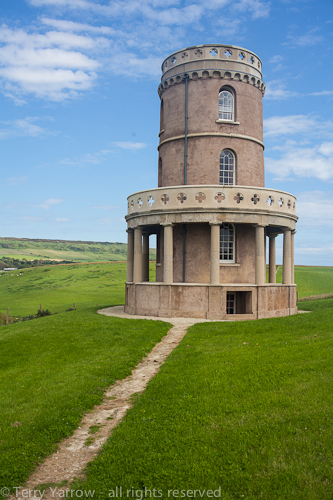 There are just a couple of downsides to staying in Clavell’s Tower – one is that you will need to book it some two years in advance because it is so popular, and the other is that although there is a track that leads up to the tower, guests are not allowed to drive up it which means you will have to park by the bay and climb the steep hill on foot carrying your luggage! 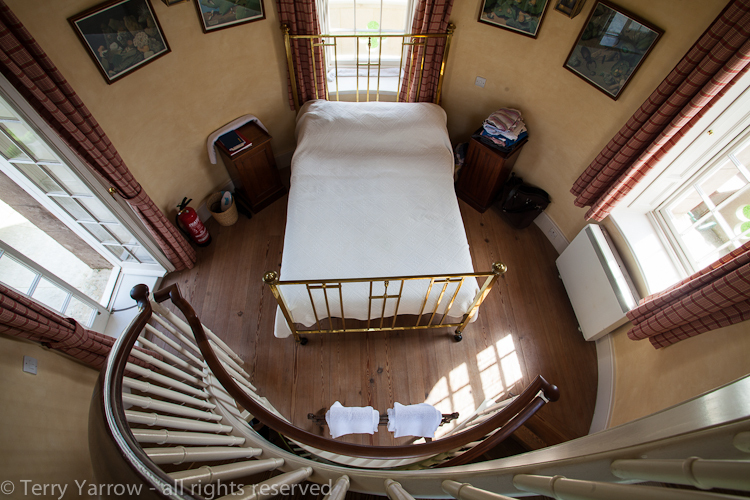 It pays to travel light when you stay at Clavell’s Tower!! There is a lot of history to this place, but that is for another blog. 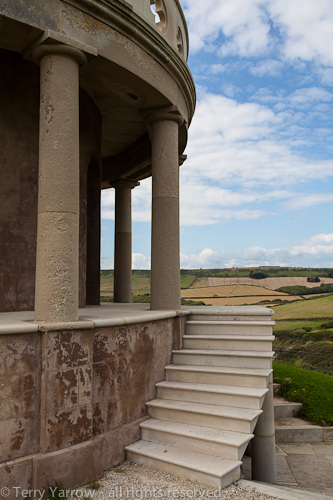 Thanks Liz and John for allowing me to invade your privacy and view the inside of this beautiful Clavell’s Tower – I hope you had a great holiday :)! 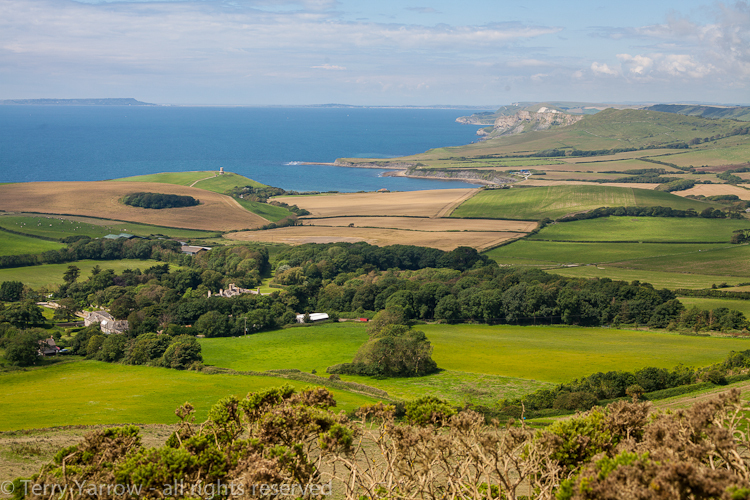 So, it was on with the walk but only a short hop down the hillside to reach Kimmeridge Bay where I intended to take some time out from walking and take some pictures that would hopefully capture the essence of the sea in summer. This is much more difficult than you might think. I sat on the rocks watching the waves gently rolling over the shoreline and the constantly changing light and movement with the sun reflecting off the water creating an ever changing array of what I can only describe as bursts of light like twinkling stars in the night sky. It was beautiful to watch but to capture it with the camera was like trying to catch a rainbow. I set the tripod up and tried a few long exposure shots, creating a milky smooth water effect against the hard crispness of the rocks. 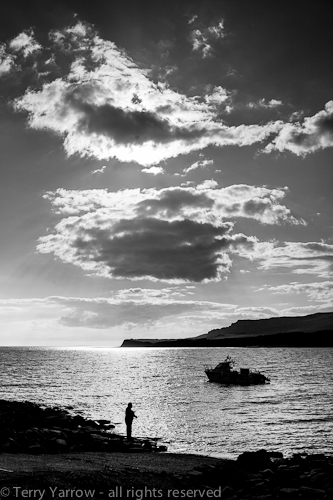 Finally I tried to capture some of the activity in the bay which is a popular place for snorkelling, boating, fishing and just rock pooling. I sat for some time dangling my feet in the water to cool down but the sun was getting lower and it was time to move on as I still had a couple of miles to walk. 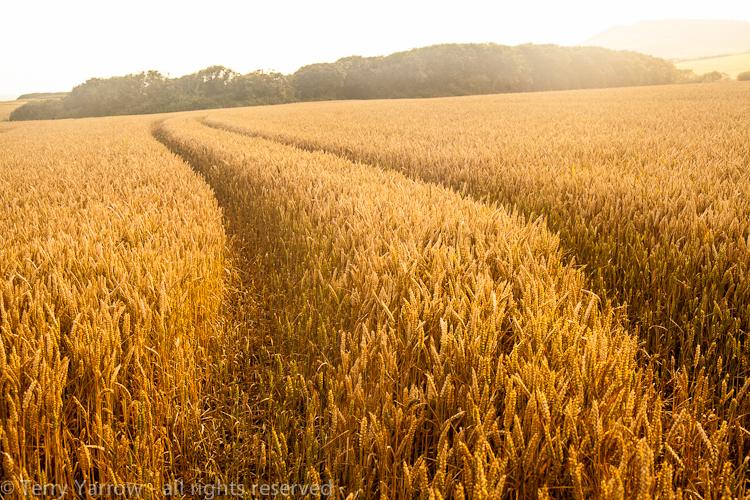 As I made my way back, a gentle sea mist rolled across the fields adding a beautiful atmosphere to the golden fields. 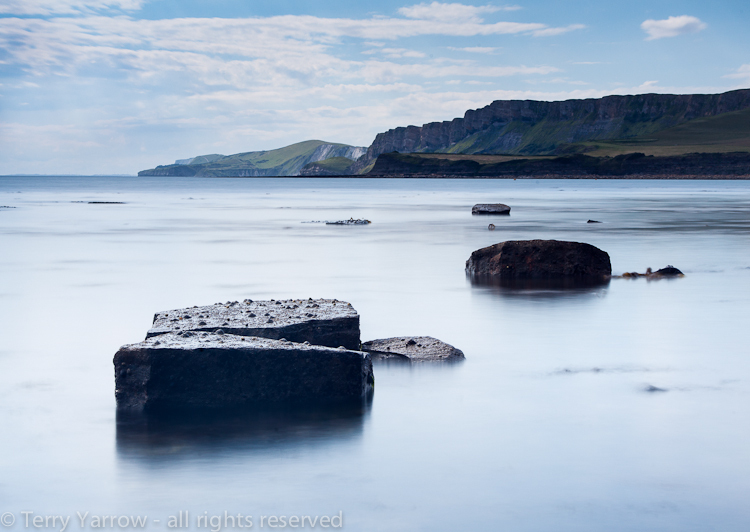 Kimmeridge and the surrounding area is a special place and one that I always love to visit whether it is as part of a long walk, or just to sit and ponder and drink in the beauty. This walk hadn’t gone as planned, but it turned out even better than I had expected because of a chance meeting with two kind people who gave me the opportunity to see something I hadn’t had the opportunity to see before. My only disappointment was that there was no staircase up to the tower roof ;)! The photographs on this blog are all copyright of The Dorset Rambler and must not be used in any way without permission. Previous Of wet and mud; of birds, butterflies, bulls and bullocks; and of tuneful church bells! Next A walk of contrasts, of new birth, of a disappearing ghost, and a jar of chutney :)! Sure makes my feet itch to go on a good ramble. Beautiful places in nature and architecture. Thanks! What a fabulous spot! Great pictures. Thanks for taking me with you!! 10 miles for you is a “slightly shorter” walk??!!! Whoa. At the most, I’ve managed 9 miles. What would be a long walk for you? Now you’ve made me curious. We have had a mention on your BLOG. How exciting 🙂 We loved the pictures and reading about your walk. 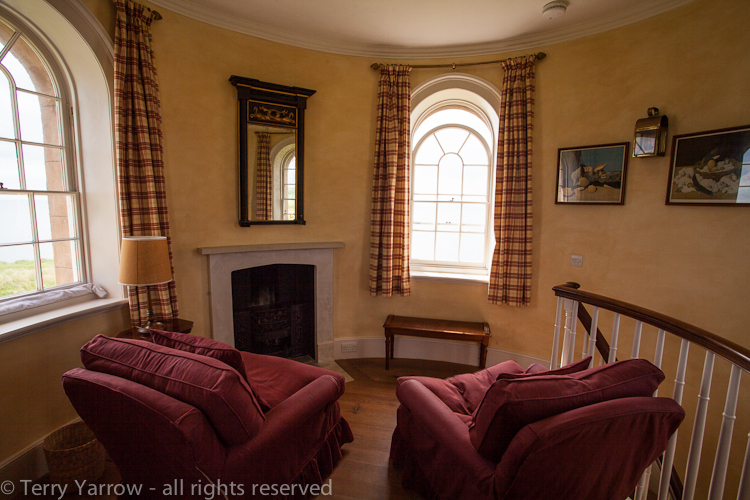 If you fancy walking in The Cotswolds at any point or around Oxfordshire we have a spare room at our house! Can’t find your email anywhere! I do love the Cotswolds – a few years ago I walked The Cotswold Way, 100 miles in 5 days. It was great, except I had an Achilles tendon problem so had to take pain killers all the time. Can’t believe I walked all that way with that problem – good job I didn’t do any permanent damage! Terry, The quality and number of photos on this blog is truly amazing. I’m running behind, due to some computer problems and an extra load at my job, but I finally got to reading again. 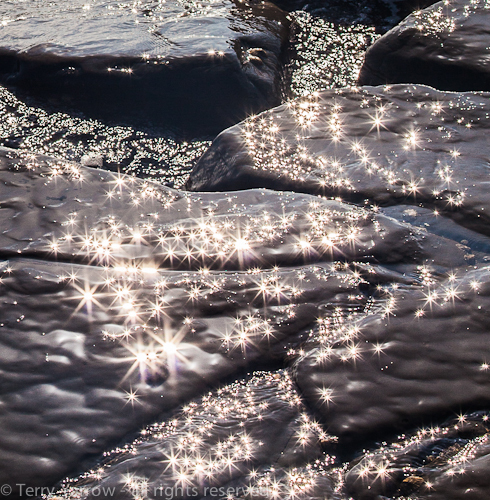 This is a great post, and I am totally awed by your picture of the water on those rocks. It really does look like twinkling stars.